Usually, thanks to careful planning by the National Grid, and other energy companies, the lights do usually stay on. Sadly, however, this doesn't always happen. On August 14th, 2003 a catastrophe hit the North East coast of America. During a storm, an overgrown tree hit a power cable. The safety mechanisms cut in leading to a local shut down of the power supply to the part of the network closest to the affected cable. Unfortunately, there was a software error in the control room, which meant that the shut down spread and spread. As a result the whole of the North East of America and large parts of Canada were plunged into darkness. In the figure on the right you can see a satellite image of the North East of America, with the ringed black area showing the black out. The resulting blackout lasted for about two days, and affected an estimated ten million people in Ontario and 45 million people in eight US states. The event contributed to at least 11 deaths and cost an estimated $6 billion. So, could this happen again? One of the main reasons for a power failure is a phenomenon called a Voltage Drop and this is directly related to properties of the solutions of a quadratic equation. There are two real solutions if and no real solutions if . A graph of the two solutions is given below, with the special point , (where there is only one solution) highlighted. 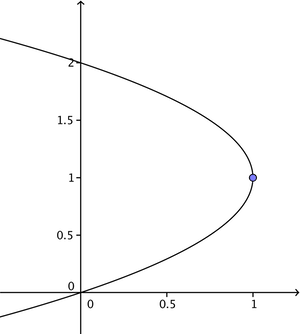 A graph showing the two solutions of x2-2x+c=0 for different values of c.
This point is very important as it marks the boundary between when the quadratic equation has two solutions and none. It has various names including a fold point, a saddle-node bifurcation and, most provocatively a tipping point. 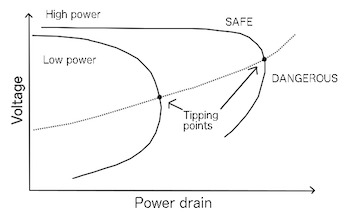 Tipping points are common, and they are important in many scientific fields,and are also of huge importance in power supply networks. To see this, consider the graph below showing the voltage in a network (shown on the vertical axis) when it has to supply a reactive power Q (shown on the horizontal axis). The curve on the left corresponds to a network with fewer power stations and thus less available power, and the curve on the right to one with more power stations on and thus more available power. Nose curves – graphs of power versus voltage for smaller and larger networks. Each nose curve has, as we might expect, two solutions for a given value of Q before the tipping point. The upper part of the curve represents a stable solution (where slight variations in Q doesn't dramatically change the voltage) in the normal voltage range, which is where we want to operate the power grid. 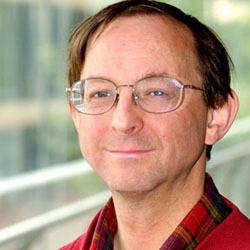 However as the reactive load Q increases a worrying sequence of events occurs. Firstly the supplied voltage starts to drop, and then we get to the tipping point there is no solution at all. What happens at this point is that the grid goes into a very unstable state during which the voltage collapses and all of the lights go out. It is fair to say that, due to good planning and management by the National Grid Company, the UK has never experienced a widespread voltage collapse. However, it has occurred in both Italy and Sweden as well as in the NE USA, and all because a quadratic equation didn't have a solution. There are other causes of power cuts, for example on 13th March 1989 the particles emitted from a large solar flare so overwhelmed the safety systems of the Quebec power system that a power cut resulted. Quebec also suffered later on from a power cut caused by an ice storm. Energy matters to all of us, and the challenge of supplying enough energy in a clean and safe way, is one of the greatest challenges faced by humanity. Energy supply networks are already highly sophisticated, and will get more so as the way in which we use and supply electricity is changing rapidly. To deliver a secure supply well into the future will require equally sophisticated mathematics. However, the bottom line is, that to keep the lights on we all need to be able to solve (lots of) quadratic equations. You can find out more about the quadratic equations that result from mathematically describing a network in the next article. This is the second of three articles in this series – you can read more in part i and part iii.